Professor Soltanalian receives the 2017 IEEE Signal Processing Society Young Author Award. The prestigious award was presented to Dr. Soltanalian by IEEE Signal Processing Society President, Professor Ali H. Sayed, on April 16th during the opening ceremony of the 2018 IEEE International Conference on Acoustics, Speech, and Signal Processing (ICASSP) in Calgary, Canada. 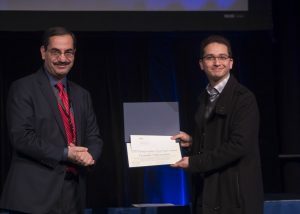 Dr. Soltanalian was named the winner for the paper Designing Unimodular Codes Via Quadratic Optimization, which was co-authored by Petre Stoica and published in IEEE Transactions on Signal Processing, Volume 62, No. 5, March 2014. Eligibility for the award is based on a three-year window, afforded to assess the impact of papers through a longer time frame. All eligible papers then go through a careful selection process administered by the society and will be judged on the basis of general quality, originality, subject matter, and timeliness. This paper deals with quadratic programming which refers to a procedure used in solving commonly encountered problems of mathematical optimization for a certain class of functions. The award honors the author of an especially meritorious paper dealing with a subject related to the society’s technical scope and appearing in one of the society’s solely owned transactions or the Journal of Selected Topics in Signal Processing and who, upon the date of submission of the paper, is less than 30 years of age.